According to the Father of History Herodotus, the Lydians claimed to have invented dice games, but that is not true. 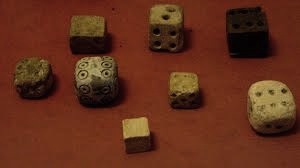 We have found dice in Egypt going way back to c. 3000 BC, almost 2,000 years before the Iron Age Lydians. 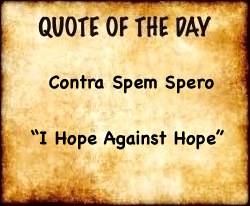 It will never be known who first carved from bone or wood the first die or dice (plural) and proceeded to engage his friends in craps, from the French word “crapaud” meaning “toad” after the way of playing the game crouched and poised on the floor or sidewalk like toads. 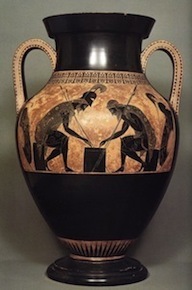 There is an exquisite c. 540 BC terra cotta vase from the Vatican Museum showing Ajax and Achilles, heroes of the Trojan War (c. 1200 BC), in full armor playing dice on a game board. 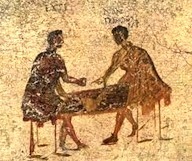 The ancient Romans had two games played with dice: Tali and Tesserae. Tali used four dice and the best score was when each die showed a different number. Tesserae was played with three dice and the best score was three sixes. Bad scores were called “dogs” and the high scores were called “Venus” after their goddess of love. 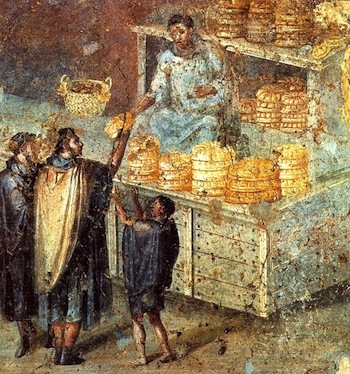 They threw from a cup called a fritillium and usually played on a board made of wood, bronze or marble. The wealthy had marble boards encrusted with jewels and had their names incised into the back of the boards.